When you want asbestos removed safely, don’t look beyond Stormont Service! With over 55 years of experience in the asbestos removal trade, we specialise in providing a broad range of services to residential homes, commercial buildings and industrial sites. When taking on asbestos removal in Central Coast, don’t try to do it on your own without having the proper training and knowledge. Our fully experienced and licensed team is here to help. Our fully trained team of asbestos removalists have extensive industry knowledge and practical background to efficiently handle projects of any size. 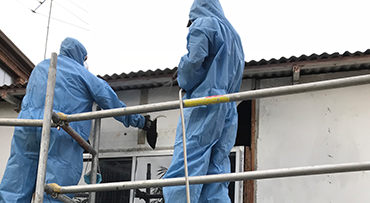 Our asbestos removal experts are highly experienced and have AS1 qualifications and they use latest tools and equipment to complete the job on time and in a hassle-free manner. We are a fully licenced company and have all the required legal qualifications to carry out all types of asbestos removal services in Central Coast and the surrounding areas. We are fully insured and are licenced with WorkSafe NSW and WorkCover NSW for Asbestos Removal. [License No. AD212807]. We follow high safety standards to make sure no harm is caused to your property or to the people living in your house. At Stormont Services Pty Ltd, we are well aware about the huge health risks posed by the presence of asbestos in your property. We give topmost priority to safety and provide our clients with the complete package, including asbestos inspection, asbestos assessing and an in-depth safe asbestos removal service – all for a cost-effective price.